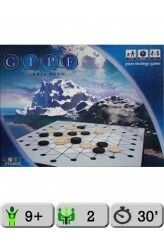 GIPF is a strategic game for two players based on a classic concept: in turns, players introduce one piece into play until achieving four-in a-row. Players then remove their row and capture any of their opponent's pieces which extend that row. This principle of capturing pieces creates each time again completely changed situations on the board. The purpose is to form successive rows of at least 4 pieces, until the opponent has no piece left to bring into play. GIPF is not only the name of a game, but of a project as well. 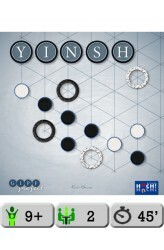 This project concerns a group of games and extra pieces that will follow step by step. Each game of the project will be playable either separately, or, by means of extra pieces, in combination with GIPF. It concerns a system that makes winning or losing GIPF-relate..
Vikingschepen zitten vast in een gigantische maalstroom op zee. Kan jij de schepen veilig uit de storm loodsen? 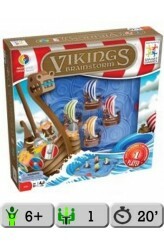 Bij dit originele denkspel bewegen de schepen op een heel speciale manier, namelijk door de boten te draaien doorheen de puzzelstukken met het water. Maar opgelet! Vaak zullen sommige puzzelstukken de beweging van andere blokkeren. Enkel een gewiekste Viking met inzicht in de beweging van de draaikolken zal kunnen ontsnappen aan de draaikolken. Inhoud: spelbord, 4 drakars (schepen) + 4 pijlen voor de eindpositie, 9 ronde puzzelstukken, boekje met 60 opdrachten en oplossingen. https://www.youtube.com/watch?v=rn6WDGC6lzo .. The players each start with 5 rings on the board. Every time a ring is moved, it leaves a marker behind. Markers are white on one side and black on the other. When markers are jumped over by a ring they must be flipped, so their color is constantly changing. The players must try to form a row of 5 markers with their own color face up. If a player succeeds in doing so, he removes one of his rings as an indication that he has formed such a row. The first player to remove 3 of his rings wins the game. In other words, each row you make brings you closer to victory-but also makes you weaker, because you have one fewer ring to play with. Very tricky! https://www.youtube.com/watch?v=Ho8OxwpMbc8 ..